Description: Statistical Literacy is the ability to read and interpret statistics, and think critically about arguments that use statistics as evidence. This site provides everything you need to know about statistical literacy with key publications, news items and eminent authors in the field. Description: School science experiments, inspired by London 2012, encourage students of all ages to take part in fitness investigations. How do you compare to Olympic athletes? We recommend students analyse their class experiment data and submit their findings to the SPoC Poster Challenge. Description: SPoC is a statistics poster challenge available to all school students. It is free to enter and certificates and prizes are awarded to the best entries. Description: Coincidences tend to be ‘surprising matches’ – sometimes they are lucky, sometimes unlucky, sometimes just mind-boggling. This site contains accounts of coincidences submitted by the general public - to date there have been over 3000 submissions which make interesting reading over a hot drink and a biscuit. Description: Roambi transforms data into immersive, beautiful mobile analytics for any iPhone or iPad. Description: The world population has exceeded 7 billion. Discover some interesting statistics about yourself in terms of the population now and since the the start of the world. Description: One of the best books on statistical graphics - beautifully presented. Author: Tufte. Description: A beautiful range of examples for the idea of visual thinking. Presenting data and information at its best. Author: Tufte. Description: Gallery of statistcians from the latest IASE Conference. Description: The documentary takes viewers on a rollercoaster ride through the wonderful world of statistics. Description: Gapminder promotes a fact-based world view, with astonishing data visualisations. Description: An exploration of human emotions. Description: The objective of the ISLP is to contribute to statistical literacy across the world, among young and adults, in all walks of life. A repository of international resources and news in Statistical Literacy is provided on the website. ISLP also run a Statistical Literacy Competition. Description: Should I have a flu vaccination or not? Is it safer to travel by car or by plane? Can early-detection screening tests for cancer prolong my life? Questions like these are the research focus of the team led by Professor Gerd Gigerenzer. Interesting videos, publications and quizes are available. Description: Probaby the most watched statistics rap video available on the web. Very amusing. Description: Take part in 6 mini tests to discover how your mind works. Interestingly males and females are likely to perform differently for each of the tests. Description: Can you spot whether someone is faking a smile? Take part in the smile test. Description: R is a free integrated suite of software facilities for data manipulation, calculation and graphical display. It is the most powerful, free statistics software available, but does require the user to invest a considerable amount of time to fully appreciate the capabilities. Description: We use the forum to find tips and solutions when developing bespoke data tools in Excel. Description: Statistics are key to understanding news, developments, and decisions. Updated daily, Significance brings you a statistical view of what's going on in the world. Description: IASE, the International Association for Statistical Education, seeks to promote, support and improve statistical education at all levels everywhere around the world. Description: TinkerPlots is exploratory data analysis software designed for use by school students. Description: Trendalyzer, named Motion charts in Google Charts, is the information visualization software for the animation of statistics. Description: getstats is a 10 year campaign, launched in 2010 by the Royal Statistical Society to improve how we handle numbers. Description: Conker Statistics support the celebration of Statistics through Statistics2013. The goals of Statistics 2013 include increasing public awareness of the power and impact of Statistics on all aspects of society especially among young people. Description: We like the free subscription that allows up to 10 questions and a hundred responses per survey. For more questions and responses we build our own surveys. Description: data.gov.uk brings together the important UK public datasets for anybody to download and analyse. Description: A well established international project providing real data collected by school children for analysis within the classroom. 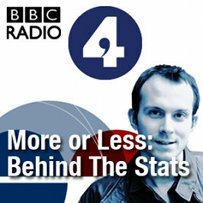 Latest podcasts, updated weekly, from the BBC More or Less radio programme. Tim Hurford and his team try to make sense of the topical statistics that surround us.